Today I am happy to announce I am collaborating with Lilla Rose on another awesome giveaway! Rebekah Behrens, an independent consultant is our sponsor and will be gifting one lucky winner with a Lilla Rose headband! These gorgeous hairbands are easy to use and add a fun kick to any hairstyle. The flexible band at the back allows for easy adjusting whether you’re wearing it atop the head or all the way around. They come in a wide variety of colors and patterns and the adjustable band matches nearly any hair color. Overall, I found them easy to use and loved combining two together for an added bit of variety. With the comfortable adjustable strap, it is very easy to add a bit of glam to your style with these pretty bands. If you’re interested in the flexi-clips, be sure to watch the sizing and styling videos to see which one works best for you! Be sure to check them out on Facebook and Pinterest too! Now for the Lilla Rose Headband giveaway! Visit Lilla Rose, and comment below which style hairband you’d love to win! Giveaway is open to both US and International shipping addresses, but winner is responsible for VAT and customs. All NEW US customers receive a FREE flexi when they spend $40 or more! *Place an order of $40 or more (excluding tax and shipping) through Rebekah’s website, then message her to redeem your free surprise flexi! Offer valid for U.S. customers only and expires May 1, 2015. This is for both new and returning customers, but if you already have another Lilla Rose consultant, please stay with her; I’m sure she’ll appreciate it! Thank you! Elizabeth Arden PREVAGE® Anti-aging Daily Serum is a facial treatment for lines and wrinkles. It contains those glorious antioxidants while also firming skin at the same time. Ever since having baby Cohen, my skin has been in need of a major makeover. Before getting pregnant, I had very dry skin but then it became more oily during my pregnancy. Now with getting less sleep and my hormones all mixed up I have needed a change up in my everyday skincare. This anti-aging serum is exactly what I have been looking for. I have read that getting less than 8 hours of sleep can cause your skin to look more tired resulting in looking older. A powerful serum that I can apply everyday is definitely beneficial to this new mama. This creamy orange lotion is very pleasant to apply and has a mild flowery scent that fades quickly. The texture is creamy smooth and dries very quickly. I absolutely love this because it works perfectly under my everyday sunscreen. When rubbed into the skin, the product becomes invisible. The skin is left with a soft sheen and immediately looks more moisturized. The effect seems to last all day, and is cumulative. Within two days I noticed that my skin looked more luminous and moisturized with smaller pores too. PREVAGE® Anti-aging Daily Serum is clinically proven to reduce the appearance of lines, wrinkles, sun damage and uneven skin texture. It is formulated with Idebenone, a powerful antioxidant that fights environmental threats including pollution, UV rays, and smoke. It has been proven to help target the signs of skin damage caused by environmental assaults. It is a wonderful alternative that gives skin a smoother, firmer, more resilient look. PREVAGE® has been a wonderful addition to my skin care routine. It has given me the most noticeable results and I now apply PREVAGE® first thing in the morning. Once it sinks in, I layer my sunscreen over the top then apply the rest of my makeup. My skin looks much better than it has in the past month, clearer, brighter, softer and more moisturized. Consider this a new favorite! Elizabeth Arden PREVAGE® Anti-aging Daily Serum is available at ElizabethArden.com, Macy’s and Nordstrom. Do you plan on trying PREVAGE® Anti-aging Daily Serum to reverse the signs of environmental damage to your skin? Tell me in the comments for a chance to win a $100 VISA gift card. This sweepstakes runs from 4/6/15 – 5/31/15. As soon as the weather warms up, I love getting a cute pedicure and slipping into some sandals. Sandals are one of the easiest styles of footwear this time of year. Whether you are wearing that perfect Spring dress or a pop of colored denim, there’s a super cute sandal to complete your outfit. Sandals are a major staple in my wardrobe. When the weather is warm, there’s nothing better than a pair of lightweight sandals, like these ECCO Touch 25 Sandals, because they are effortless and comfortable. These sweet strappy sandals have a bit of ‘edge’ but still maintain that girl-next-door look that I love. My favorite part is that the leather covered footbed provides excellent cushioning so I have all-day support which makes them a definite favorite this season. They make looking chic and staying comfortable an effortless feat. Now that I am a new mom, carrying around all of Cohen’s gear is an absolute must every time I leave the house. Having a bag that fits everything while still looking trendy and fashionable is definitely a must in my book. This ECCO Finley Versatile Tote is perfect with its durable canvas material yet is still trendy with the leather and brass detailing. It also has a convenient pocket inside so I can keep my essentials separated from the rest of Cohen’s things making them easy to find when I need them. One aspect of this bag that I also love is that it has optional straps on one side so I can toss it over my shoulders when I need to use both hands. Regardless of where I am going or what I am doing it always seems like I am carrying a thousand and one things. Being able to throw this bag onto my bag, freeing up both hands for either holding Cohen, feeding him, or carrying his carseat to and from the car is a convenience that is definitely appreciated by this new mama. Now that Spring is here I am curious to know what’s your favorite spring shoe trend? Tell me below in the comments for a chance to win an ECCO shoe card worth up to $250! This sweepstakes runs from 4/2/15 – 4/30/15. Be sure to visit the ECCO brand page on BlogHer.com where you can read other bloggers’ posts! The Mary Kay® All American Girl makeup look is perfect for the woman who loves things girly, whether that means a pinch of color on your cheeks or a kiss of apricot on your lips. With spring right around the corner, it’s the best time to bring our bright colors and pretty pastels. It’s the perfect season to warm of your complexion with a soft rosy cheek, luscious lashes and kissable lips. Step into gorgeous, with this classic girl next door look. Make your everyday look rosy and radiant to match the season. As I looked through the products and tested them out, I was so excited about how creamy the eyeshadow was, how smooth the liner applied, and the sparkles in the lip gloss that I knew would be perfect for everyday. I have been transitioning back into wearing a pretty pink gloss and felt it would be perfect for my spring beauty routine. This look was effortless and easily replicated. I swept the cream eyeshadow on my lids before patting the mineral eyeshadow color over the top. Then I applied the liner to my lash line and loved how creamy smooth it was. It didn’t tug or pull on my skin. Next, I added a few swipes of the Mary Kay® mascara to my lashes. This mascara worked great for lengthening and separating my lashes. I swept a hint of blush on the apples of my cheeks. Then to finish off the look, applied a few dabs of lip gloss for the perfect spring look! Follow these steps to get your own All American Girl look with Mary Kay®! Step 1 / Start by sweeping the Mary Kay® cream eye color in Pale Blush over the entire eyelid, keeping it below the crease. Step 2 / Next, apply the eyeshadow shade Precious Pink Moonstone over the cream color. Step 3 / Carefully line the upper lash line with the Mary Kay® liner. Step 4 / Swipe a few coats of the mascara on the top and bottom lash line. Step 5 / Sweep a bit of Strawberry Cream blush onto the apples of the cheeks. Step 6 / Finish with a swipe of lip gloss in the shade Fancy Nancy. To see how to recreate this look visit the Mary Kay® website and don’t forget to view the other two looks: Queen of Country and Boho Beauty! Then leave a comment below letting me know which look you like best to be entered for a chance to win a Mary Kay® gift basket! Hey friends!! It’s been many months since we’ve done a camera giveaway here on the blog, and I have had so many people asking when we’ll be doing one again that I couldn’t wait to stick on on here. 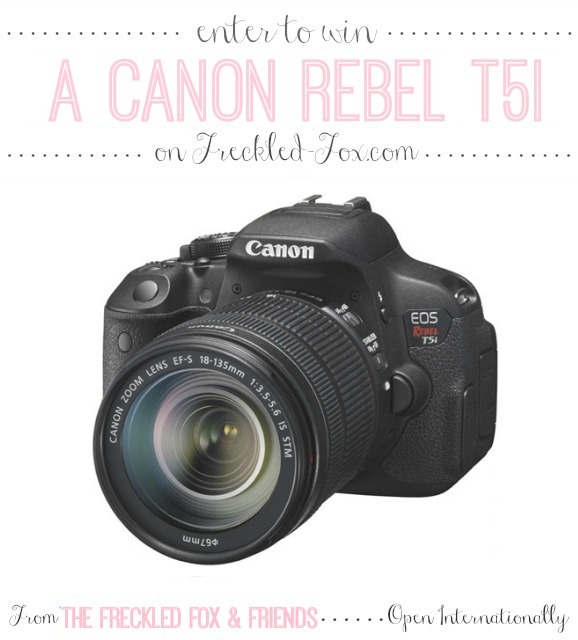 There’s one big difference with this giveaway from all the others though, and it’s that we’re not giving away a Rebel T3i today, we’re giving away a T5i! It’s an amazing feeling to send off such an amazing camera to one of you guys, knowing what a massive difference it will make for your blog or shop, or just every-day photography in general:) Even better than that though, is introducing so many of you to this group of such lovely shops, and such hard-working and inspiring woman! I can’t tell you how relationships online have influenced my life for the better, so make sure to take a minute and go say hi!